High pressure builds out west midweek as an existing low-pressure system moves to the east. Seasonal temperatures and dry conditions are forecast through next week. 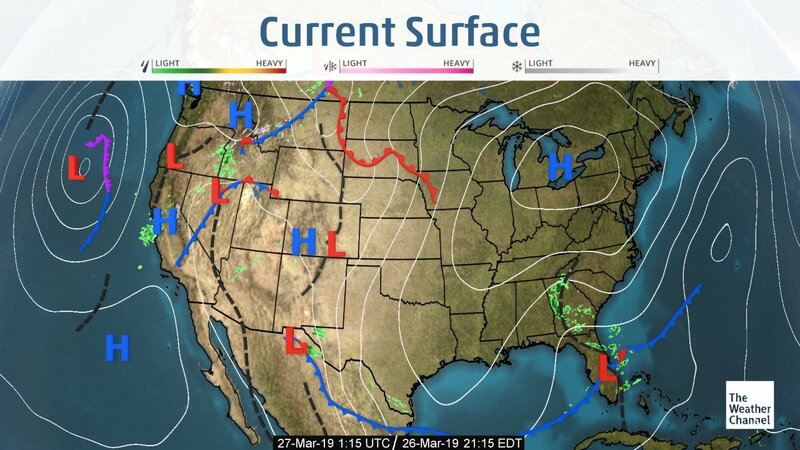 Warm temperatures and gusty winds continue across the Southwestern Desert regions as seasonal storm systems pass to the north. Nice conditions look to continue across the growing regions of Mexico. Generally, dry conditions across Florida through the weekend with a strong system expected mid-week. California and Yuma trucks remain plentiful again this week. Washington apple trucks are ample as well. Idaho potato and onion trucks remain steady. The national average on diesel didn't change this week and is currently at 3.080 per gallon. 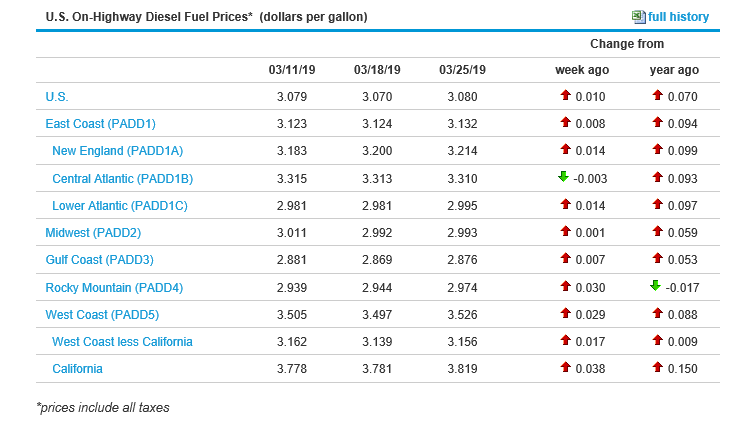 California prices remained steady this week and are now at 3.819 per gallon. Crude oil prices went up slightly and are currently at 59.69 per barrel. The apple market continues to chug along steadily. We continue to see decreased volumes in the Midwest/eastern growing regions as shippers begin to wind down their season, shifting demand (both retail and foodservice) demand out west. Also, much of the remaining inventory is tilting toward bigger sizes, putting pressure on shippers to consistently come up with smaller, foodservice sizes while keeping up with retail demand on bagged apples. This has caused gradual price increases on some varieties. As of late, receivers are keeping their inventories lean (cleaning up for end-of-month) which has slowed movement. As schools begin to reopen - coming off of spring break, expect this state of affairs to continue for the rest of the season. Know that some size substitutions may be necessary going forward. Midwest/eastern regional growers continue to wind down, we are seeing prices slowly rise as foodservice sizes become less available. Some major retailers are heading west to get orders filled, leaving some shippers to obligate much of their remaining fruit to contract business. Not much change from last week out of Caborca. We continue to see strong supply and it is expected to continue thru this week. Next week we will start to see a decline in supply as growers start to close up fields due to seasonality in the Caborca region. Obregon is now starting up with production and is expected to be in production thru May. Markets on both coasts is lower due to less demand and more supply. As of March 25th, we saw the first report for 2019 on the USDA mid mostly. California fruit is in the $40+ range and will increase. This is the “Perfect Storm” growers have been waiting on to ramp up the harvest. The crop is estimated at 160 million pounds, this is 50% less than last year. Fruit is trickling in as the majority of the fruit is being exported, Asia being one of the bigger players consuming the majority of the pack out and paying a premium. The rain has been good and the last time growers had to irrigate was back in January. With the small crop this year, some growers are strip picking. Strip picking makes for an even shorter season but helps strengthen the coming crop for 2020. We can expect light offerings for the next few weeks and volume will ramp up for the Cinco De Mayo pull. Crossings are down from Mexico (combined with a light California crop) causing US inventory to be down by several hundred loads week over week. Demand remains high, as we are seeing prices spike between $5-$10 per box on all sizes. The growers have been asking for more money in the fields to make up the percentage of #2 grade fruit. #2 grade fruit makes up 20% of the pack out. Last Monday, the 18th was a no pick, no pack holiday in Mexico. The pipeline has cleaned up as we are seeing less fruit at the border. Last week ended with a slight curtail in the harvest volume in anticipation of higher prices for the coming week. There is plenty of fruit on the trees but, Mexico has slowed down the harvest to control the market at a higher price. Keep in mind the week of April 14th is Holy week and there will be little to no harvest going into Easter Sunday. The industry will ramp up for Cinco De Mayo shortly after. We can expect prices to hit well over $40 by the end of the week. Demand has gotten stronger with an active market. Prices will be well over $40 by the end of the week. The pipeline has cleaned up as we are seeing less fruit at the boarder. There is plenty of fruit on the trees, this is Mexico slowing down the harvest to control the market with California having light offerings. The green bell pepper supply is better, some new fields have started in south Florida adding some supply and better quality. Don't be fooled though, pepper supply is still not plentiful, demand has been very slow for the month of March, retail prices have been escalated and orders have shrunk. If business picks back supplies will tighten up very quickly. Quality has gotten better for the most part, older fields that some growers are still picking to cover orders for smaller sizes and choice pepper have some scaring and discoloration issues. •Green Bell Pepper- Good volume of green bell pepper arriving in Nogales this week. Better volume currently being harvested from both Mexican districts. The quality on green bells from both remains good. Green bell pepper supplies currently meet demand. Supplies on green bells are expected to remain steady through the week. Market on Green bells has started to decrease on all sizes with better production. Green bell peppers from Mexico are also available to load in McAllen, TX. •Red Bell Pepper- Good supplies of Red bell pepper continue to arrive in Nogales, AZ from Mexico this week. The market/price on red bell pepper is steady after decreasing over the last week. Good volume on both elongated and Hot House bells in all pack styles. Steady numbers on both varieties are expected through the week. Quality of red bell on both varieties is good. Red bell supplies from Mexico currently crossing through both Nogales, AZ and McAllen, TX. •Yellow Bell Pepper- Moderate volume of Yellow Bell pepper continues to arrive in Nogales this week. Both elongated and Hot House varieties being pack in 11lb/15lb and 1 1/9 bushel carton. Quality on both varieties is good. Currently, demand exceeds supply. Market on the yellow bell is still strong. Yellow Hot House bells are also available to load in McAllen, TX. Blackberries continue to be in good supplies coming out of Mexico. Quality has been fair with some shippers running into problems when holding inventory too long. The market remains steady. The only shortages at this point are due to the transfer truck delays that are occasionally occurring. The blueberry market is active with Mexico gapping and export numbers down due to the end of the Peruvian import peak. Central California and Florida have begun to produce in a light way but should steadily increase over the next few weeks . look for the market to increase slightly through the end of the week . Quality on leftover imports is fair at best . Florida and Central California are producing very nice quality right now. Raspberries are in moderate supplies with some shortages being reported due to weather and transportation difficulties. Prices took a modest upturn this week with quality being reported as good. We should see light but adequate supplies through the end of the week. All production is coming out of Mexico at this time. Strawberries continue to be in high demand with California now being the primary source for shipping. Florida and Mexico are all but finished which is adding extra pressure on the California shippers to perform. We are experiencing spring showers but the major rain events seem to have subsided. Temperatures are warming and we expect the volume to steadily increase over the next few weeks. Look for a firm market through the end of the week with heavy demand. Next week should be similar but better supplies are anticipated which should ease market pressure downward. Quality is very good right now and improving daily. The broccoli bunch market has stayed steady with the nice weather in Yuma and Mexico while the crown market has picked up. This warmer weather the next several days in Yuma and Mexico is helping to spur growth. Look for supplies to stay steady with the improved weather. Quality is good with slight purpling, some mechanical damage, and occasional yellow cast. Cauliflower has come off this week with more supplies in all areas. The Yuma weather continues to spur the growth process which has brought the fields ahead of schedule. The fields next week are looking to gap with supplies becoming much tighter. Overall, the quality is good with minor bruising and yellow cast with weights in the 25 to 28-pound level. Look for the market to get tighter going into next week. This market for this commodity continues to set unprecedented prices throughout the industry. Demand exceeds supplies. The strain on availability will continue throughout the end of this month as well as April. Some suppliers don't expect this commodity to have normal availability until late May to June. Oxnard and Santa Maria are the growing regions for this commodity with little to nothing in production in Yuma. Mexico has been a region a few shippers have been harvesting in and this has helped with availability. Oxnard and Santa Maria does not have the availability to meet demand. The overall quality is fair, with pith, insect damage and leafy tops being reported upon arrival. Escalated pricing will continue with all shippers. •	Jalapenos- Good supply of Jalapeno continues to be available to load in Nogales, AZ from Mexico. Growers continue to harvesting jalapeno out of the Sonora and in Northern/Southern Sinaloa. Quality is good out of both growing districts. Mostly medium to large size is available from both growing regions. Market on jalapeno has stabilized in the mid-teens. Jalapenos from Mexico are also available to load in McAllen, Texas. •	Serrano – Good supplies of Serrano peppers available to load in Nogales, from Mexico. Supplies are expected to remain steady throughout the week. Supplies currently meet demand. Price on Serrano pepper has decreased to the teens this week. Serrano supplies also crossing through McAllen, Texas. The Cilantro market continues to stay steady in Yuma and Mexico with the recent warm weather in Yuma and Mexico. The cilantro quality is fair and has been affected a bit by the colder weather at the beginning of January. Look for the cilantro market to continue to stay steady going into next week. District 1&2 (Central Valley & Southern California Coastal Region) is coming along nicely and peaking on 75ct/95ct/115ct. The smaller tightening up for the next couple months expect limited availability in 165’s/200’s/235’s moving forward. Prices are firming up and looking to remain steady in the high $20’s on small size choice and fancy fruit. The rain and cold weather brought on the larger fruit and smaller fruit is staying limited on sizing and green on the trees. The market continues to be active and is expected to continue on a weekly basis. Inbounds from Mexico have been very light and demand has increased. Peak sizes remain to be 200’s & 230’s. Industry-wide, we should expect 110’s & 150’s to be light in supplies. The rest of March will be a very short month on quantities. As we approach April some suppliers are thinking prices might come off, but realistically it’ll be a week to week deal if that stands. We are advising customers to avoid running lime ads for March due to unpredictable quantity and lack of commitments from the growers. Good supplies starting off the week on navels, with plenty of volume to promote on most sizes. The Central Valley is expecting rain Tuesday night through Thursday morning. Most suppliers got in front of it and shouldn’t affect supplies this week. Quality is looking great and markets are looking steady with plenty of deals to be made to help move fruit. On Specialty Citrus we still have plenty of Delite Mandarins that are peaking on 15’s & 40’s. Pummelos Sunkist grade is peaking on 12/14/18/23 size, quality looks great. Cara Caras & Blood are moving along, steady supplies are available. Golden Nugget Mandarins Ojai Pixie Tangerines are coming along nicely, quality is looking a lot better and the taste is excellent. Please reach out for pricing. Cucumbers are in good supply, Honduras is winding down for the season, the last imports will land this weekend. Florida has started and volume is picking up with growers on the east and west coast starting to harvest. Cool weather has slowed the start of the season but quality on the first shipments has been very good even with all the wind south Florida gets this time of year. We expect steady supplies for the next few weeks as Florida enters the peak of this season. Cucumbers are being harvested in Pompano and Immokalee now and will move up to Plant City in about 2 weeks. Honduran Imports will finish for the season this week. Eggplant supply is very light and quality is only fair, wind and cooler temperatures have hurt fruit with scarring and discoloration. Demand for eggplant has been very slow and the market has dropped over the past week in spite of declining supplies. Production on eggplant will be light until new spring crops start in Plant City in mid-April. Eggplant continues to be harvested in the Mexican State of Sinaloa. Good supplies of eggplant currently being harvested from this growing district. Both fancy and choice grade continue to be packed. Market on eggplant is expected to remain steady through the week. Quality from Sinaloa on fancy and choice pack continues to be mostly fair to good. Import green grape supplies have started to slow down quickly. Fresh arrivals will become more and more limited as we move forward and shippers will be relying on storage fruit to fill the demand. Quality will become challenging as we get closer to the end of the import season. Market prices have started to climb this week and are expected to continue to increase moving forward. Unfortunately, Mexico and Coachella are still 4-6 weeks away from starting, so we can expect green grapes to become increasingly limited moving forward. Market prices and supply will be subject to change swiftly. We will monitor this situation closely. Supplies will become very limited and prices will continue to climb. Mexico and Coachella are expected to start mid May. Import red grape supplies remain consistent. Quality is good and markets have been flat. We expect to see continuous arrivals of fresh fruit from Chile through the entire transition period. Shippers are not expecting any disruption in order fill rates. Market prices have declined and leveled off. All sizes are available on both the east and west coasts. Mexico and Coachella are scheduled to begin harvest in the beginning of May. We expect a smooth transition with a slight overlap. Mexico and Coachella will start early May. The Green Onion market continues to come off with the recent nice weather in Mexico. Currently, the weather has cooperated and we are seeing plenty of supplies as a result. The recent cold weather in January is causing occasional leaf minor and mechanical damage. The green onion market will continue to level off going into next week. Production on this commodity is coming out of Huron and Yuma. There is a pricing gap among the multiple shippers in the growing regions. The quality continues to be hit and miss. Defects being reported to include ribbing, mechanical, mildew, and puffiness. The quality in Huron has been reported as cleaner but weights are less, averaging 3-5 pounds lighter than in Yuma. Very favorable weather in all the growing regions is in the forecast for this week and next. Overall the market is slightly down. All value-added products are at its normal channel pricing. Light supplies of romaine is being harvested in Huron. The quality is stronger compared to the product in Yuma. Reports out of Yuma on romaine continue to shoe blister and peel, discoloration, cupping, mechanical. and wind burn. Yuma production will continue for 2-3 weeks longer. The plants in Yuma are tired, and although the weather is favorable, inconsistent quality continues amongst all the suppliers in this region. Green and red leaf, as well as butter, has quality that is also fair at best. Demand has been moderate to light. Salinas looks to have production in the first to second week in April on romaine as well as all leaf items. Salinas will have leaf production the first to second week in April. The Tender Leaf market continues to be steady on spring mix, arugula, baby spinach, and cello spinach. Quality is good with minimal yellowing and bruising of the tender leaves. Look for these items to be steady going into next week. Weather conditions continue to be good in Central America. Prime melon growing weather with highs in the 90s and lows in the 60s. Market on cantaloupes is steady and seeing a good supply on larger fruit. Guatemala, Honduras and Costa Rica are all exporting excellent quality fruit with good brix levels ranging from 11-14%. Demand is good and consistent quality internally and externally. Guatemala continues to feel the presence of the whtiefly. Overall shipments were down last week 24%. Light supplies of watermelon continue to be available to load in Nogales, AZ this week. The Watermelon crop from Colima is expected to finish this next week. Quality from this district is fair to good. Watermelon crop from Sonora, MX could begin as early as the first week of April. Market on watermelon is currently high and is expected to remain high until the Sonora, MX crop begins. 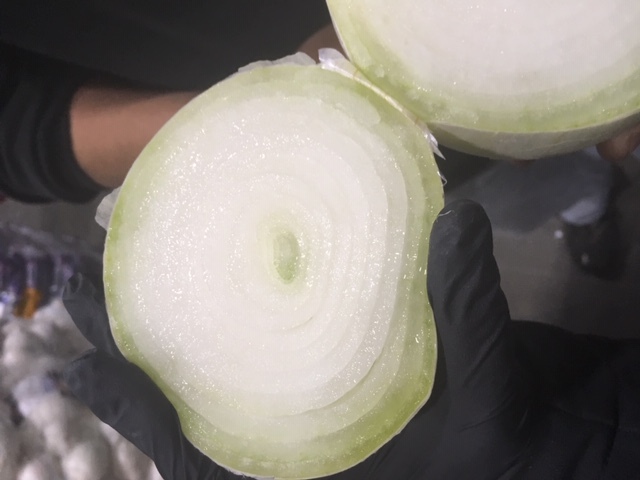 Onion markets in the Northwest have made a turn downward as demand has eased with improved supplies of domestic and Mexican onions in Texas. Suppliers in Idaho and Washington will look to clean up storage volume over the next 4-5 weeks. Texas domestic red and white onions are expected to hit the market next week. Mid-April will see the new crop California desert yellow onions come into play with red and whites following behind late April/early May. As new regions come into the marketplace expect pricing to continue coming off over the next few weeks. As we approach April and the end of the storage season in the Northwest, expect to see translucency as the primary quality issue with occasional soft (see pictures below). 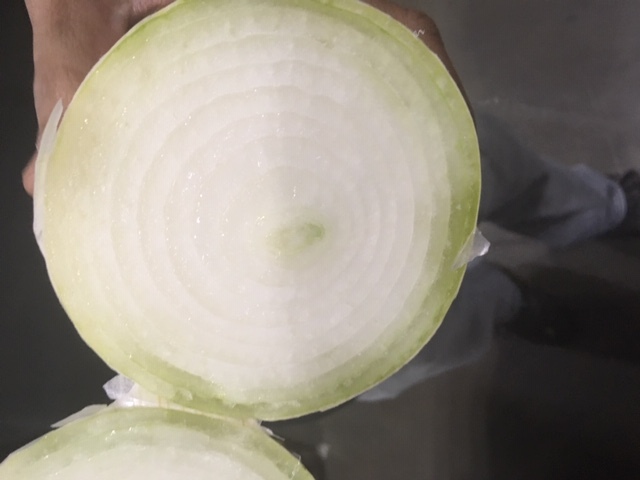 It takes two full rings of translucency to be considered a quality defect and is highly recommended to have proper air circulation in onion holding rooms for this time of year. Availability on Washington D’Anjou, Red D’Anjou, and Bosc remains steady with deals to be had on volume buys (especially on Bosc). Expect the overall market and prices to stay steady for the immediate future. Demand for pineapples industry-wide and tighter supplies before the Easter pull will provide challenges covering certain sizes in full. Suppliers are doing their best to keep up with the current demand. Quality is looking good and Current market prices on all sizes are between $10-$12. Russet potato carton markets have stabilized as consumer demand remains sluggish. Most suppliers are moving into Burbanks which are leaning to the smaller size profile. Markets look to remain stable over the coming weeks with the majority of the supply in the 90 count and smaller. Washington, Colorado, and Wisconsin are other areas of production with limited larger sizes as well. Quality issues continue to show some internal/external bruising, light hollow heart, external cuts, light peepers, and occasional soft rot. We continue to recommend advanced order placement to ensure full coverage. Colored potato markets remain relatively steady in all regions. California red B size potatoes are in good supply with a slightly lower market with the gold potatoes out in Florida showing some strength with less volume available this week. All three colors (red, white and yellow) are available in both California and Florida. Washington, Idaho, North Dakota only have red and yellow at this time. Mt Vernon, WA will finish for the season this week and start up new crop again late August. Quality remains excellent out of Florida. Squash supplies are very good for now, quality has been good on green and getting better on yellow squash after a list of issues the past 2 weeks. Demand for squash is better this week as new fields in central Florida. Homestead and Immokalee are still shipping good supplies and will continue through April, Plant City is just starting with light supplies. Expect supplies and pricing to stay steady through the week, if demand continues increasing, growers could push the mark up early next week. Good to moderate supplies on both Italian and Yellow S/N squash crossing through Nogales, AZ this week from Sinaloa, MX. Volume is decreasing from this growing region on both varieties as we head into the month of April. Some growers have already started to harvest soft squash from the Sonora, MX growing districts. Market on soft squash has stabilized but could increase through the end of the week as more growers begin to finish up their Sinaloa crop. Quality on both Italian and Yellow S/N squash from Sinaloa is fair to good. Quality on squash being harvested In Sonora is mostly good. Chilean stone fruit supplies remain fairly consistent but limited on size. Market prices have been flat. All varieties are heavy on the large size with most of the fruit being packed in a tray pack rather than volume fill. Quality is being reported as good. As we move forward, we expect to see the import season slowly start to taper off through April. Domestic crop will start in early May. As it looks now, shippers are expecting good yields and a robust domestic season. Chill hours, rainfall and early blooms have all been beneficial to the upcoming domestic harvest. Florida tomato growers have made it though seasonal transition helping markets return to normalcy going into the month of April. Coming out of a short gap in production this week, favorable weather should help boosts harvests next week for round, roma, grape and cherry categories. Overall quality is good and supply exceeds demand. Markets are forecasted as stable through the Easter Holiday barring a weather event. A warmer weather trend has helped boost production in new crops harvesting in Sinaloa to start the Spring season. After a slow start to the season and several weeks of elevated markets crossing AZ and TX, FOBs have returned to minimums. Tomatoes across all categories are widely available and quality is reported to be very good. Markets are forecasted to remain stable through the Easter Holliday barring a weather event.